Gilford – Situated along approximately 400ft. 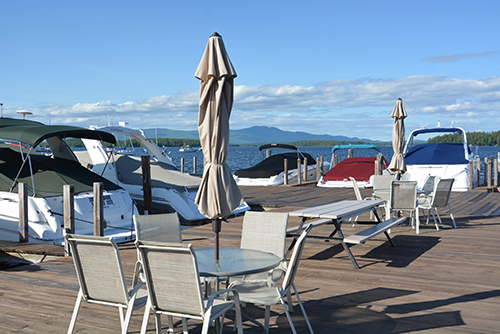 of gradual sandy shorefront in Saunders Bay of Lake Winnipesaukee, this community is home to a huge docking system featuring an expansive sun deck built over the water with permanent boat slips for each owner. A gazebo, outdoor pool and tennis court are also included. Individual condominium cottages and attached condominium units are located on both sides of Rte. 11B with spectacular views. The walk in sugar sand beach is beautiful.